Summer is in full swing in sweet home Alabama! The beaming sun in the daytime and the Katydids at bedtime solidify the season of humidity is here. 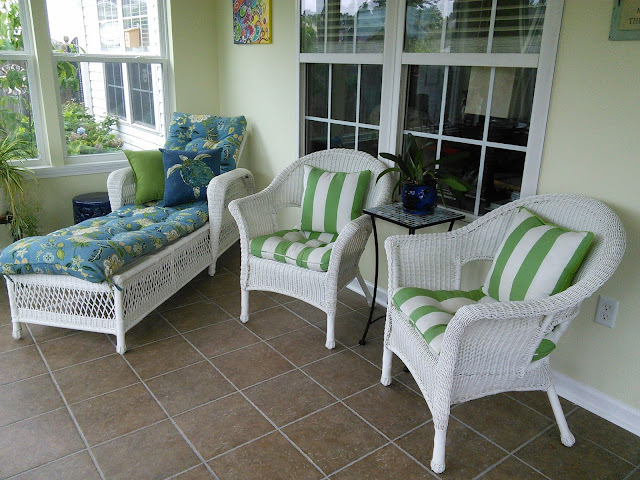 Time to be outside on a patio or on a front porch or enjoying a good book in a sun room. 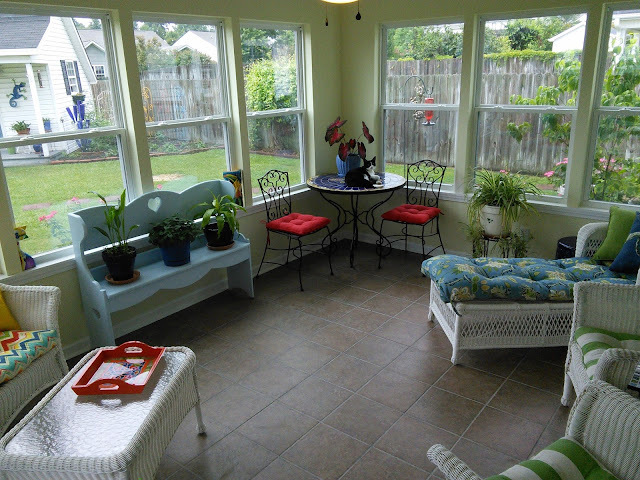 And, do I have a cute sun room to show you. My friend Anita and I were colleagues for seventeen years. She's now retired after twenty-seven years in the classroom. She's a Master Gardener with the greenest of thumbs. 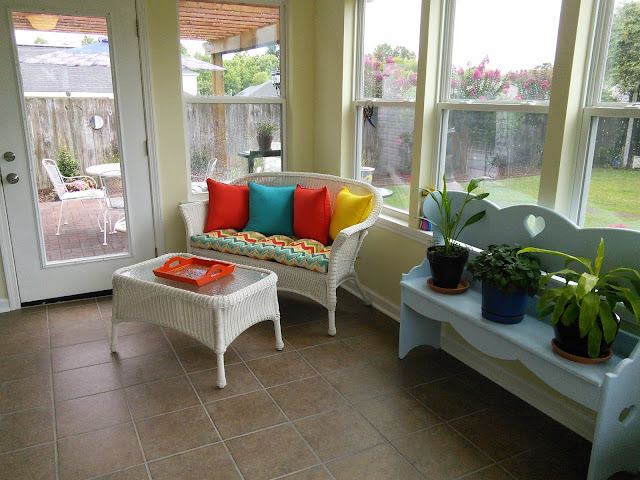 Today I'm going to show you her trendy and comfy sun room and in a later post, I'm going to give you a tour of her gorgeous yard and her cool "she-shed." Enjoy the summer inspiration! One of three cute, unique corners. This one serves as a dining area. Morning coffee probably tastes better in this spot than any other spot in the house. One of her eight cats getting in on the action. Cute corner number two. A perfect reading nook that would probably turn into the perfect nap spot for me after a couple of chapters. Notice the turtle. It's fitting that Anita would have a turtle pillow. She has made several trips to Costa Rica over the past few years and has helped rescue endangered leather back sea turtles at Estacion las Tortugas. When she was teaching, she took groups of students to help in the rescue efforts as well. A field trip to Costa Rica - doesn't sound too bad, does it? And corner number three, perfect for just sitting and enjoying the sun, is my favorite - I like the happy colors. Do you see what I see? The wooden, hand-carved cat observing from the window is from Costa Rica. The mask below, also a souvenir from Costa Rica, is from the indigenous tribe of Bri Bris near Cauita on the Carribean coast in the mountains between Panama and Costa Rica. During her visit, she rode horses for part of the way and hiked to the steepest part. The Bri Bri live isolated from the world and have their own culture and language. The mask embodies the spirits of many animals. These colorful, eye-catching masks are made of balsa wood. This is a picture of an artisan at the oxcart factory in Sarchi, Costa Rica. 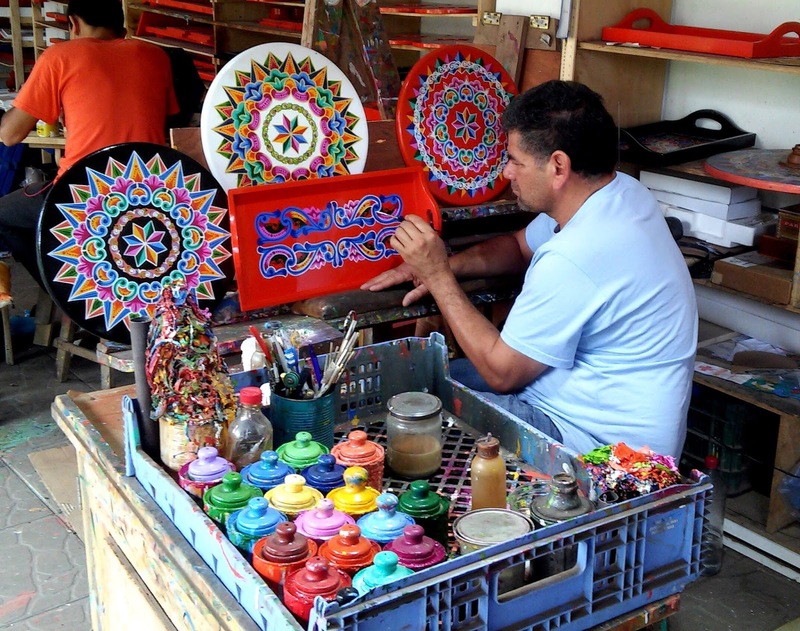 The tray on Anita's wicker table is an original, hand-painted work of art from the factory. A big thank you to my friend Anita for showing us where she enjoys the sun. See the white building through the wall of windows? That's her she-shed. I'll show it to you soon!